The name Alcatel may not mean too much in the United States, but the smartphone brand is bringing the first Android Go to the country, the 1X. Although you can pre-order the Alcatel 1X in the US, the smartphone will not be released until June 4. 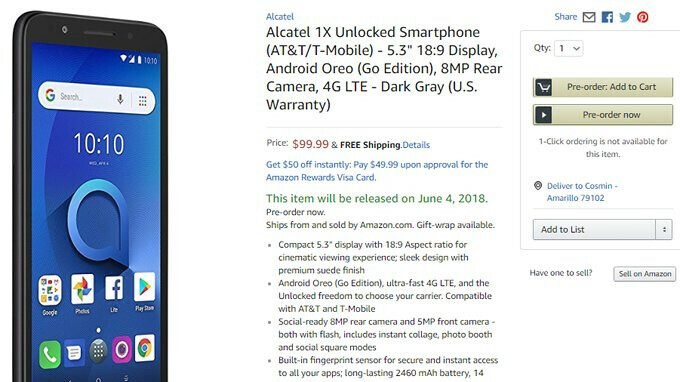 As far as the price goes, customers can buy the Alcatel 1X for just $99.99 via Amazon, a great price for what the phone has to offer. And with Android Go, Alcatel 1X will benefit from some the latest improvements Google has added to the mobile platform. Hardware-wise, the Alcatel 1X is an entry-level smartphone, hence the low price. It does pack a 1.3GHz quad-core MediaTek MT6739 processor, 1GB RAM and 16GB expandable storage. Also, the phone sports a 5.3-inch display with an unusual 480 x 960 pixels resolution and 18:9 aspect ratio. There's also an 8-megapixel photo snapper on the back side, while in the front, the Alcatel 1X includes a secondary 5-megapixel camera for selfies. It's worth mentioning that the Alcatel 1X comes unlocked, but it will only work on GSM carriers in the US such as AT&T and T-Mobile, so there's that. I'd go with the Umidigi A1 Pro. It's between $99-120, and has much better specs.